Elms College offers private scholarships and grants to students based on financial need, as well as academic achievement. There are also many federal, state, and private grants available to students. The list on this webpage includes some of the better known resources offered publicly and directly through Elms College, however there are many other scholarship programs available to students to reduce their costs of attendance, such as Outside Scholarships. The following is a list of merit-based awards offered by Elms College through the Office of Admission for incoming first year, full-time students. Upon acceptance to the college, students will be notified about their eligibility for the award. Students are only eligible for one of the following merit-based awards through the Office of Admission. 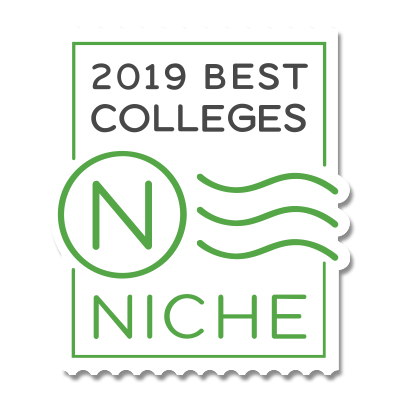 Eligibility for any of the following merit-based awards is contingent on maintaining continuous full-time student status at Elms College and requires that the student maintain a 2.8 minimum GPA. The scholarship amount is also dependent on the student’s residency status at the college. Merit awards will not change as the student progresses to his or her second, third, or fourth year at Elms unless he or she changes their residency status. Please note: Scholarship amounts below are for freshmen beginning in the 2019-2020 academic year. The following is a list of merit-based awards offered by Elms College through the Office of Admission for incoming transfer students. Upon acceptance to the college, students will be notified about their eligibility for the award. Students are only eligible for one of the following merit-based awards through the Office of Admission. Eligibility for any of the following merit-based awards is contingent on maintaining continuous full-time student status at Elms College and requires that the student maintain a 2.8 minimum GPA. Merit awards will not change as the student progresses to his or her second, third, or fourth year at Elms unless he or she changes their residency status. Please note: Students enrolled in degree completion programs through the School of Graduate and Professional Studies are not eligible for merit scholarships. Scholarships amounts listed below are for transfer students beginning in the 2019-2020 academic year. Offered to applicants admitted to our Accelerated Nursing Degree Program with outstanding academic records, the award can range from $6,000 to $10,000 per academic year. The Elms Accelerated Nursing Scholarship is automatically renewed for the length of the Accelerated Nursing Degree Program and requires that the student maintain continuous full-time student status at Elms College and a 2.8 minimum GPA. Students are encouraged to apply for outside scholarships through reputable scholarship search engines. Outside scholarships can reduce educational borrowing or reduce a student’s remaining cost of attendance. All outside scholarship search websites listed below are provided as a courtesy and do not imply an endorsement by Elms College. Please use caution when applying for outside scholarships to avoid possible scams. See Finaid.org’s Scholarship Scams – If you have to pay money to get money, it’s probably a scam. Elms College participates in several different tuition exchange programs, including the Tuition Exchange Program, Inc (TEP), the Council for Independent Colleges – Tuition Exchange Program (CIC-TEP), and the Catholic College Cooperative Tuition Exchange (CCCTE). Students eligible for these programs are dependents of an employee who works at an institution that also participates in the programs. Students will receive a full-tuition scholarship per year for a maximum of four years. Students must remain in good academic standing to be eligible for the benefit. Students receiving full-tuition scholarships will not receive any other institutional financial aid but can receive other need-based financial aid from federal, state, and private resources.